Malaria is among the highest causes of death in tropical countries. It has troubled scientists and health practitioners for many years but a cure that seems to be more effective has been found in a certain plant. The scientists have been using Artemisia annua (sweet wormwood) for their traditional medicine for ages and artemisinin is obtained from this plant. They refer to it as Qinghaosu. It has been found to act rapidly against Plasmodium falciparum malaria. It actually has the fastest action among all anti-malarial drugs. This parasite is most common in Africa. Use of this extract on its own is highly discouraged since parasites have been found to develop resistance to this drug. Malarial treatment is, therefore, a combination of different extracts but with artemisinin as the base. The Artemisinin-based combination therapy (ACT) works efficiently to completely eradicate malaria parasites. The artemisinin wipes out the parasites with its fast action and then the other drug in the combination works to eliminate any traces of parasites that may not have been caught by the artemisinin. It is usually combined with a slower-acting drug which complements its fast action. Common drugs paired with artemisinin include lumefantrine, pyronaridine, and piperaquine. Cancer cells have a high liking for iron. This aspect has been used to target them in the fight against cancer. Cancer cells actually need more iron than normal because they multiply very fast. On their surface, they have transferrin receptors in large numbers and these facilitate the uptake of transferrin, which is a protein that carries iron and is found in blood. Scientists use this same pathway to attack these cells. 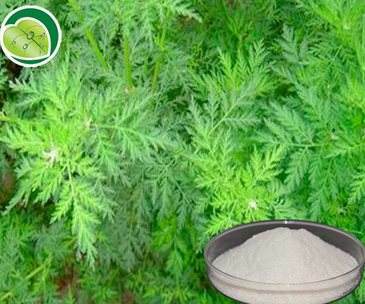 Artemisinin is attached to transferrin molecules and the cancer cells only recognize the transferrin. Once the absorption takes place the artemisinin begins reacting with the iron in the cell and gives rise to free radicals. These are chemicals that are highly reactive and attack the cell membrane and other molecules in the cell thus destroying it completely. This leaves healthy cells virtually unharmed. The worst side effect there could be is an allergic reaction to the drug but it is very rare. Otherwise, its side effects are just like malaria symptoms. One can experience drowsiness, vomiting, nausea and a reduced appetite.